Exploring Alnico Ceramic magnet combinations follows on from the first part of this Blog (see Mixed Magnets 1) which looked at pickups with mixed Alnico magnets, i.e. the tonal effects of different magnet grades in different pickups and positions. This Blog focuses on exploiting a mixture of different kinds of magnets additively. By that I mean adding the magnetic strength of magnets together. 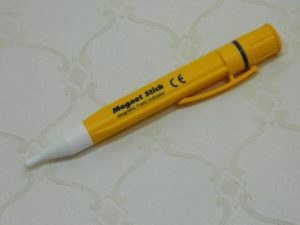 To demonstrate I have used a trusty 'magnet stick', a simple magnetic field detector that can be used to give an easy visual reference of the distance from a magnet its field strength reaches a constant threshold. 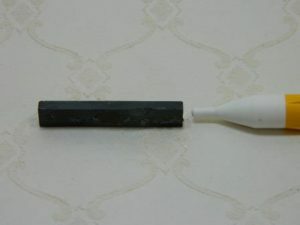 Ceramic (also known as Ferrite) magnets differ from Alnicos in their chemical composition being based primarily on iron oxide with other additives. They are physically more brittle but typically 'stronger'. To clarify, that means when fully magnetised (saturated) they sustain a stronger magnetic field than saturated Alnicos. The style used in guitar pickups are normally in bar form. the larger faces are the 2 poles so no field is detected around the edges. 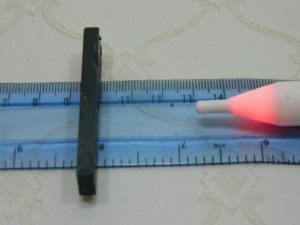 So to assess a ceramic bars field strength, the photo below shows one placed at the 10cm point of a ruler and the detector moved up to the first point it detects and illuminates, approximately 30mm away. 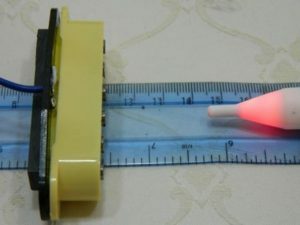 Doing the same test with a single Alnico (V) pole piece gives a detection distance of approximately 8mm. 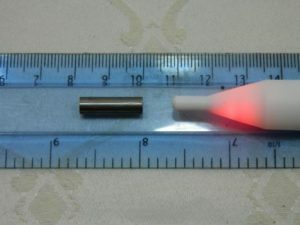 This is a much smaller mass of magnetic material of course. So far so good, but the interesting magnet phenomenon is adding Alnico Ceramic magnets together and the effect it has on magnetic strength. So starting with a normal Ironstone Alnico V magnet pickup, the distance for field detection is around 22mm. Because ceramic bar magnets have their large faces as poles, its easy to simply place one onto the bottom of the basic Alnico pickup. 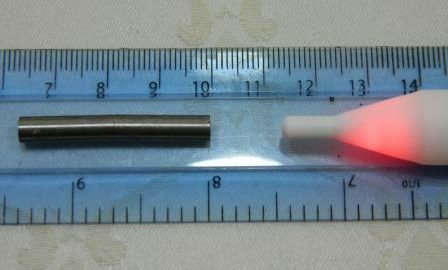 The magnet will soon let you know if you are trying to put it on with the incorrect polarity! Running the same field detection test gives a much stronger combined field output from the pickup magnetic 'system', close to 35mm. Wow! And bare in mind a magnets field strength is inversely proportional to distance squared. Or simply put, double the distance and the field strength goes down to one quarter of the original value. So clearly, this modified 'combination' pickup is going to be more sensitive to string vibrations than either style of pickup magnets on their own. This is real easy home experimentation for you to try yourself too. Ceramic pickups are available cheaply - you may even have some duds laying in the spares box. As I mentioned before, ceramics are brittle so well glued examples may break as you try to prise them off the donor pup. Patience, patience. So what does the Alnico Ceramic magnets combination sound like? This DIY experimentation is simple, cheap and good fun, but of course the proof is in the hearing. Well I have done quite a lot of test playing using a Strat that is modified for easy pickup tinkering without de-stringing etc. So I am able to get close to instant comparisons. Its no surprise to hear that a ceramic 'enhanced' Alnico pickup in any position sounds louder. But its not as dramatic effect as the experiments above would suggest. More like upgrading to higher resistance single coils than installing a humbucker for example. Conventional logic is that stronger magnets tend to kill sustain. Well this combination does not seem to have any negative impact on the time for a plucked open string to audibly decay. I suspect both of these effects are due to the ceramic magnet acting 'through' the Alnico's, just don't quote me on that! So which if either 'wins' out? Again I am not talking from a physics perspective, just what I hear. And the clear answer is its the Alnico's that predominate. The classic Strat vintage tones (like around the neck tones when played 12th fret for example) are very much there. But for me what the Ceramic adds is an extra 'crispness' that allows the Alnicos just a little more bite. That, coupled with the volume increase effect is an interesting and very usable overall effect. 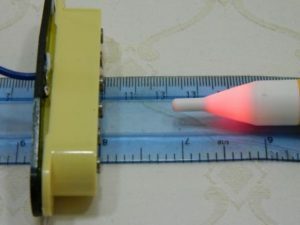 This is such a cheap and simple DIY mod, that its worthy of some experimentation. Physically its an easy mod to do and to try various combinations. In fact due to the magnetic attraction, you don't even need to glue the bar magnet(s) in place for tinkering. And there are several ways to do the 'enhancement', either on all 3 pickups or just a particular one (e.g. to get more power and bite from a bridge). Its a great way of 'upgrading' a relatively low output set (say 6kOhms) to get a much rockier feel. A bit like going from Ironstone Golds to Platinums. So I say, get out the spares box, have a bit of a tinker, and see what Alnico Ceramic magnets can do in combination for your tone!. Welcome to Ironstone Pickups, upgrade & replacement electric guitar pickup specialists based in Rutland, England. Precise materials selection, including all Alnico magnets, ensures authentic vintage tone is at the heart of all the Ironstone designs. Every single pickup we sell has been hand finished and individually tested in Ironstone’s Rutland workshop. These Ironstone pickups also exclusively feature in the hand-built Gilmour ‘Black Strat’ Stratocaster scratchplate and 5 way Telecaster control plate sets. The coolest vintage tones with outstanding value and service. Ironstone accepts most major Credit Cards and Paypal (as well as BACS and cheque payments), using Trustwave certification for your purchase security. Even the best electric guitar pickup upgrades & replacements need the right set-up to deliver the best pickup performance. For free articles, advice and recommendations on guitar pickup height adjustments, tone control components, guitar shielding, Stratocaster / Telecaster / Humbucker pickup comparisons, and much much more, visit the Support link at the top of each page.